The pound shrugged off the risk events this week and ended up dominating all. The euro and the Swissy, meanwhile, both got a severe smack-down. So, what drove price action on these currencies? And how did the other currencies fare this week? Well, time to find out! Despite top-tier risk events for the U.K., the pound ended up being a net winner for the third week running. In fact, the pound was the one currency to rule them this week. Like the past couple of weeks, however, price action on the pound was not a one-way street. The pound started the week on a strong footing. There was no clear catalyst, but the most cited reason is a short squeeze due to profit-taking by long-term pound shorts ahead of the week’s risk events. Although some market analysts also point to Greenback weakness, which gave GBP/USD a boost and dragged other pound pairs higher with it. Bullish momentum finally ran out of steam when word got out that Theresa May would be triggering Article 50 at 12:30 pm BST (11:30 am GMT) on Wednesday. After that, the pound milled about for a while before getting swamped by sellers ahead of the Scottish Parliamentary vote on whether or not to back another Scottish independence referendum. And unfortunately for the pound, the Scottish Parliament decided to back another Scottish referendum, and so the pound got swamped by even more sellers. Forex Gump has more on what the Scottish Parliamentary vote was all about, so read more about that here, if you’re interested. The pound got a final bearish kick during Wednesday’s Asian session. No clear reason why, although it’s possible that Asian traders who just woke up were pricing-in either the Scottish Parliamentary vote or Theresa May signing the Brexit letter about two hours before the drop. The pound then steadied after that and even showed some strength ahead of the Brexit trigger, very likely because of short-covering. And when Theresa May did announce that the Brexit letter was delivered to European Council President Donald Tusk, with Tusk confirming receipt of the letter, the pound jumped higher, also likely because of short-covering. After all, this event was inevitable and the market has had months to prepare by shorting ahead of the event. Anyhow, the pound’s price action diverged after that, since the pound steadied against some currencies while taking more ground from others. The pound did get a broad-based bullish infusion later on Thursday, though, and that was apparently due to optimism ahead of and easing uncertainty after the release of the white paper for the so-called “Great Repeal Bill,” which you can read here. It’s a 39-page paper with lots of technical terms, though, so just be warned. Oh, for those who have no what idea what the “Great Repeal Bill” is all about, it simply aims to “maximise certainty for businesses, workers, investors and consumers across the whole of the UK” and make the transition from EU law to UK law much easier by converting EU law to UK law and then grants MPs the necessary powers to pick and choose which law to keep and which law to discard or change. Pretty nice, yeah? Well, it should be noted at this point that a draft of the EU’s Brexit negotiation guideline somehow got leaked. You can read it here, if you’re really interested. The gist of it all is that the draft appears to give the UK a hard time while also denying some of Theresa May’s demands/request in the Brexit letter. But while the EU agrees with the UK that “Any free trade agreement should be balanced, ambitious and wide-ranging,” the EU also warned that such an agreement can’t “amount to participation in the Single Market or parts thereof, as this would undermine its integrity and proper functioning.” Still, the EU is open to a free trade deal, which is something to look forward to. The euro got a very severe beat-down this week and ended up as the worst-performing currency of them all. Interestingly enough, the euro had a promising start when most euro pairs gapped higher at the start of the week, thanks to news that Angela Merkel’s Christian Democrats won the elections in Germany’s western state of Saarland. Saarland is actually the second smallest German state, but the minor victory there apparently raised hopes that Merkel will remain in power. Anyhow, the euro extended its gains a but after the initial gap. The euro’s price action then became mixed after that before getting rushed by sellers on Wednesday. And the most commonly cited catalyst was a Reuters report, which you can read here. According to the Reuters report, six unnamed ECB sources supposedly claimed that the ECB is worried that the market is already pricing-in an ECB rate hike by early next year. Moreover, the ECB supposedly only “wanted to communicate reduced tail risk but the market took it as a step to the exit.” The ECB’s message was “was way overinterpreted,” one of the unnamed sources said. As such, these unnamed ECB sources were “keen to reassure investors that their easy-money policy is far from ending, suggesting a reluctance to change message before June.” And the euro reacted by plunging, as euro bulls, who already priced-in a hawkish ECB, decided to push the “get me outta here” button. This narrative of a dovish ECB, or at least a not-really-as-hawkish-as-thought ECB, stuck around for the rest of the week. As such, the euro finally began reacting to economic reports again, inflation reports in particular, after ignoring them for the past several months. And unfortunately for the euro, it got another smack-down when Spain’s HICP only printed a 1.1% month-on-month increase. Sure, it was significantly better than the 0.3% fall during the previous month, but it did miss the +1.5% consensus. Also, Spanish HICP only increased by 2.1% year-on-year, which is slower than the + 2.7% consensus, as well as the previous +3.0%. Germany’s inflation report also weakened the euro, since Germany’s HICP only increased by 0.1% month-on-month, missing the +0.5% consensus and much slower than the previous month’s +0.7%. Year-on-year, Germany’s HICP also increased by 1.5%, weaker compared to the +1.9% consensus and the previous reading’s +2.2%. Moving on, the euro later became range-bound on Friday. The inflation report for the whole Euro Zone was released on Friday, and it printed a 1.5% increase, which is weaker than the +1.8% consensus and previous +2.0% reading.The euro remained range-bound, though, very likely because traders were already expecting that, given the miss in German and Spanish inflation readings. The Swissy also had a bad run this week, despite the risk events, which should have boosted safe-haven demand for the Swissy. Aside from the near certainty that the sneaky SNB was weakening the Swissy again in order to deter safe-haven demand for the Swissy, we can see that the Swissy’s weakness all started during Tuesday’s U.S. session. Heck, it even lost out to the euro at the time. So, what happened on Tuesday, you ask? Well, the Swissy very likely got a double kick from the resurgence of risk appetite on Tuesday, as well as SNB Governing Board Member Andrea Maechler’s remarks. Moving on to risk sentiment, risk appetite was apparently the dominant sentiment this week, based on how the major European and U.S. equity indices fared. Although the U.K.’s FTSE 100 was slightly down, obviously because of Brexit-related jitters. Asian equity indices, meanwhile, were mixed but mostly down, thanks to dampened risk appetite in the region, which was mostly due to worries over China’s property market, market analysts say. Anyhow, European equity indices started charging higher on Tuesday and kept doing so until the end of the week, thanks to recovering commodities, which boosted basic resources and energy companies. U.S. equity indices also began charging higher on Tuesday and ended the week on a high note. Although market analysts pointed mostly to higher oil prices. The Loonie was the second-strongest currency of the week. And Loonie bulls can thank the surge in oil prices for that, since most Loonie pairs were tracking oil higher (chart for oil is inverted). Market analysts attributed the surge in oil prices this week mainly to armed protests in Libya, which halted oil production by as much as 250K barrels per day, and heavy speculation that OPEC would be extending its oil cut deal and that Russia would likely play along. The Aussie staged a recovery this week and ended up a net winner after getting stomped pretty hard last week. Oil was on a tear this week, but oil was not the only one, since all commodities got bid higher during the week, as mentioned earlier when we discussed the Swissy. And as you can see below, most commodities dipped on Monday and then surged from Tuesday to Wednesday before losing steam and holding steady on Thursday and Friday. As to what drove broadly commodities higher on Tuesday and Friday, market analysts pointed mainly to CB’s U.S. consumer confidence index for March soaring from February’s 116.1 to a 16-year high of 125.6 instead of dipping to 113.9. This blew away the Trump-related worries and stoked speculation that U.S. GDP growth would pick up, market analysts say. Aside from higher commodity prices, it’s also very likely that the prevalence of risk appetite gave the higher-yielding Aussie some love. After all, commodities steadied on Thursday and Friday. Sure, iron ore continued to climb higher on Thursday, as noted in Thursday’s London session recap. However, iron ore would later give back some of its gains during the U.S. session. Even so, most Aussie pairs continued to march higher on Thursday. The Greenback had a mixed performance this week, but was still a net winner overall. The Greenback started the week with a bloody nose, as Trump-related worries persisted, especially with regard to the pulling of Ryancare when it became clear that Republicans couldn’t muster enough votes. Fortunately for dollar bulls, talks about pushing for a tax plan by August managed to stop the bleeding and even allowed the Greenback to recover. The Greenback’s price action was steady but a bit mixed after that, before surging higher during Tuesday’s U.S. session, thanks to CB’s U.S. consumer confidence index for March soaring from February’s 116.1 to a 16-year high of 125.6 instead of dipping to 113.9. Yeah, I know, I already mentioned this when we talked about the Aussie. Moving on, the Greenback continued to show strength after that. But it became clear that demand for the pound, the Loonie, and the Aussie was stronger come Wednesday, since price action become more mixed. The Greenback continued to show strength, however, thanks to hawkish Fed remarks. In particular, Chicago Fed President Charles Evans’ comment that his “current dual mandate outlook allows [him] to support another one or two increases this year” apparently caused rate hike expectations to rise. Some non-voting FOMC members also came out of the woodworks while singing the same hawkish chorus as Evans. The Greenback later got another bullish boost (except against GBP) on Thursday after the reading for U.S. Q4 2016 GDP was revised higher from a 1.9% quarter-on-quarter to a faster 2.1% rate of expansion. It also probably helped that more Fed officials came out and delivered hawkish remarks. Unfortunately the Greenback rally began to lose steam come Friday. The Greenback even gave back some of its gains on some pairs, thanks to sliding U.S. bond yields after New York Fed President William Dudley suggested that the Fed could trim its balance sheet this year instead of hiking rates. Interesting enough, trimming the Fed’s bloated balance sheet would actually have similar effects as a rate hike, but, well, that’s just how the market wants to react it seems, or maybe some Greenback bulls used the event to take profits off the table. 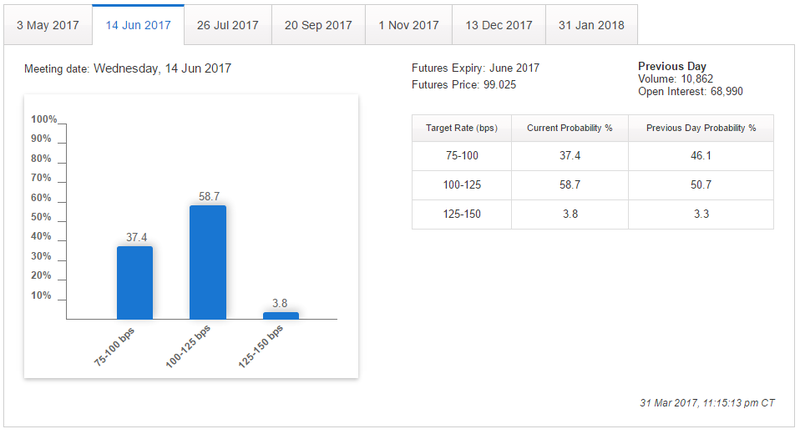 After all, odds for a June rate hike surged from 54% to a lofty 62.5% on Friday, according to the CME Group’s FedWatch Tool. The yen was, as usual, tracking bond yields for the most part, particularly U.S. bonds yields. Having said that, bond yields plunged on Monday due to Trump-related worries, mainly the failure of the healthcare bill. As a result, the yen was in the green for most of the day. However, talks about a Tax Plan by August allowed bond yields to recover later, which forced the yen to give back some of its gains (or lose them all against some currencies). Bond yields then surged on Tuesday, because of the strong reading for U.S. consumer confidence, market analysts say. The yen therefore got sapped, although safe-haven demand ahead of triggering Article 50 likely helped to limit the yen’s losses. Bond yields later plunged on Wednesday, which market analysts blamed on lingering worries over Trump. As a result the yen gained strength. However, the yen gained strength mainly against the the euro and the Swissy, which were suffering at the time. Against the other currencies, the yen had a harder time, very likely because of the risk-on vibes in the European and U.S. equities market at the time. Bond yields rose again on Thursday, mainly because of the upgraded reading for Q4 U.S. GDP, according to market analysts. Naturally, the yen got whipped as a result, but it somehow fought back against the euro and the Swissy. Finally, bonds slumped once more on Friday, which market analysts pinned on Dudley’s comment that the Fed may shrink the balance sheet instead of hiking. Although month-end buying of treasuries was also cited as a reason for the slide in bond yields. Commodities rose this week and risk appetite prevailed, at least in the U.S. and European equities market. Even so, the higher-yielding Kiwi ended up as a net loser. Stranger still is that there were no direct catalysts. And looking at the overlay of Kiwi charts, we can see that the Kiwi’s price action was a bit messy, which implies that price action on Kiwi pairs was dominated by the relevant opposing currency. And since the pound, the Loonie, the Aussie, and the Greenback were in demand this week, the Kiwi ended up being a net loser.